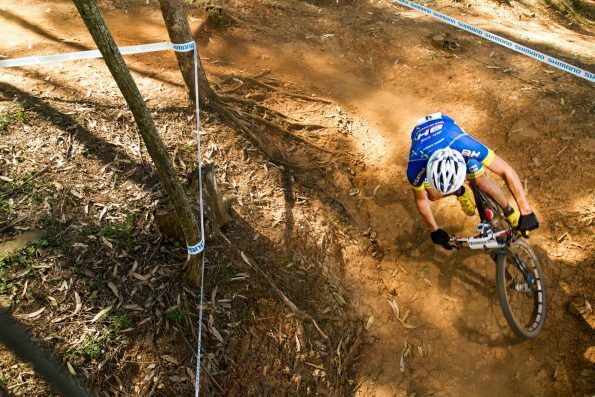 Learning how to corner on a mountain bike is one of the basics you’ll learn when you pick up the sport. Every trail has corners, and learning how to take them is the key to a smooth ride and the best way to stay on the bike instead of the ground. But plan on whipping out a few times, especially when you come across sudden, muddy corners. Once you’ve mastered the technique, everything will get a whole lot easier. You’ll need to learn how to twist your body, when to brake, and what to do with your hands when you’re coming around corners. 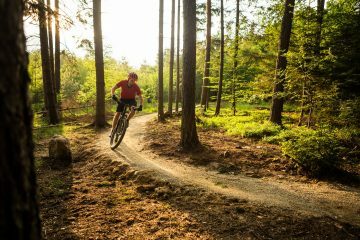 It sounds like a lot to think about all at once, but mountain biking is all about using your whole body. The first thing you’ll want to do when cornering is to make sure you’re sitting up in the seat of the bike. This will give you more control. Instead of tilting your body, you’ll want to keep your body vertical and lean the bike into the curve. Staying upright can be difficult when you’re first learning, but it’s the key to mastering corners. Leaning the bike into the turn is what will help you get around it in one piece. Learning how far to lean the bike takes practice and likely a few falls, but you’ll quickly be able to tell how far to lean based on the sharpness of the corner. Always keep your knees bent when you’re going around a corner. You’ll find that your knees will likely be pressed to the bike when you’re turning. Don’t worry, this is a good thing. Tight corners require you to lean the bike quite far. If you’re doing things correctly, your body will stay upright. Your hands will help you keep your weight evenly distributed. Keep them tight on the bars and bend your elbows. 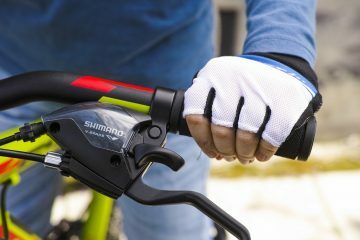 When you get into the turn, you’ll want to release your hands from the brake and press them into the handlebars. When you’re taking a corner you’ll always want to keep your eyes ahead so you know what you’re coming up against. Looking down can throw off your balance or you might end up hitting rocks or mud, causing you to slip. Keeping your gaze ahead also allows you to see the exit on the corner (which we’ll get to in a minute). As you can see in the video, you don’t want to pedal into a turn. For most corners, you’ll want to keep your outer foot down with your heel pressed down as well. This keeps the back tire firmly on the ground. 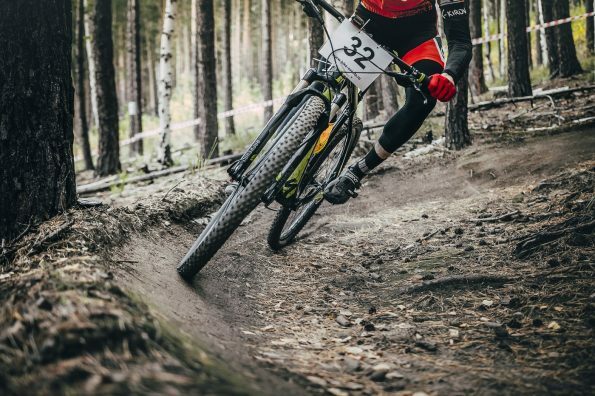 If you know you’ll constantly be riding on difficult terrain, it’s best to have clip in pedals with the correct shoes. This will hold you more firmly to the bike. You’ll want to do all your braking before you come up to the corner. If you brake as you’re going around the turn, your wheels will slip and you’ll end up on the ground. Avoid hard braking as you come into the turn. You’ll want to reduce your speed gradually to keep your tires from slipping. Obviously, you don’t want to completely stop, but how fast you’re going will depend on the type of corner you’re up against. 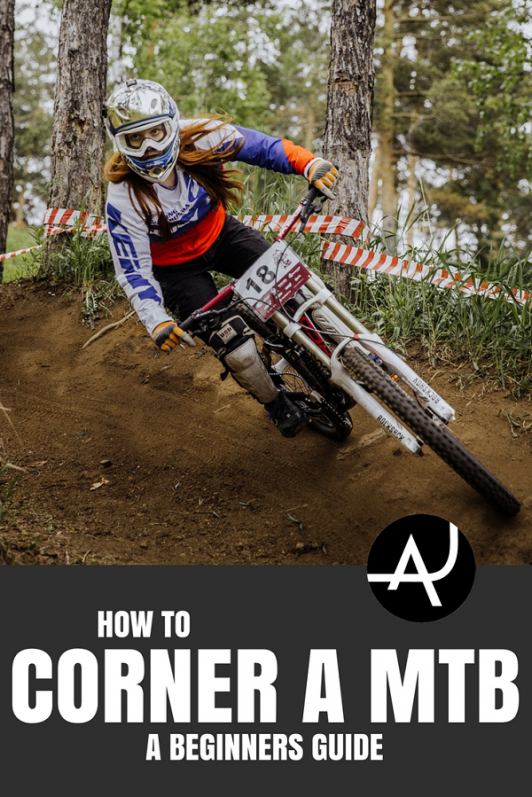 Learning how to properly corner on a mountain bike is all about keeping the flow of your ride. Exiting a corner is the same. Doing it properly allows you to keep up speed and keeps you from wasting energy. As you exit a corner, you’ll want to gradually straighten the bike. Jerky movements will make you lose balance and speed. You’ll want to exit to the outside of the corner. This will keep you going fast and give you the time to straighten out your bike. You’ll also want to lean back slightly. This is for safety and speed. If your bike does slide out on the corner, you won’t be leaning forward. This means you won’t be thrown over the handles bars which, trust me, hurts a lot more than tipping over the side. Taking on fast corners takes little more precision and you’ll have to move your body and lean the bike very quickly—like the rider in the video below. These fast turns also sometimes call for a different foot position. You’ll want to keep your feet horizontal instead of the traditional one foot down pose. As the rider in the video puts it, keeping your feet both at the same horizontal position allows you to get back to your basic position more quickly. This means you’ll be able to get back to pedaling quickly in order to keep up speed. Switchbacks are tight turns that you’ll want to take pretty slowly. They’re frequently 180 degree turns, so taking your time is critical. These turns are where it’s especially important to keep your outer foot down and heel dropped. It’ll keep your weight down on the bike, helping you stay on. It’s also particularly important to keep your eyes ahead on these turns. You’ll want to see your exist as soon as possible so you know when to turn. Hairpins are very tight, often downhill curves. Watch the video below to see just how your body should be positioned. Handlebar control is crucial in these turns. You’ll want to make sure to have them turned in tight towards the curve. If you’ve got multiple corners one after the other, you’ll need to turn the handles bars quickly and sharply. You’ll also want to make sure your body is firmly pushed forward. You need to have excellent control of the front wheel, and your body weight is what will keep the wheel firmly on the ground. Riding off road will eventually lead you to not so perfect terrain, including mud and rocks. 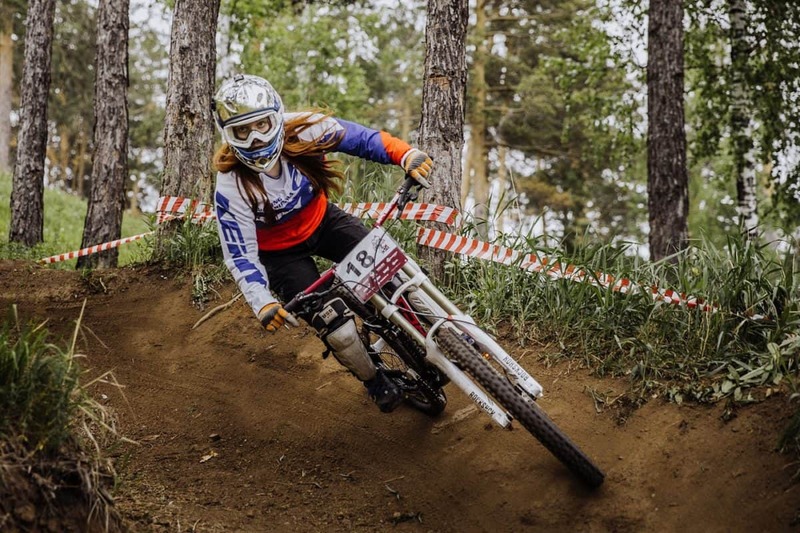 The good news is, if you know how to corner correctly, it’ll be no match for a mountain bike. The first rule of biking on difficult terrain—don’t brake. This causes your tires to lose traction and you will slide out. While landing in mud doesn’t hurt as much as landing on the hard ground, it’s still not fun if you aren’t expecting it. When you hit a patch of mud your bike will slow down but your body will still be leaning forwards, that’s a good way to fall over your handlebars. You’ll want to lean back a little bit to make sure you and the bike are going at the same speed. As stated above, keeping your body upright is the most important part of cornering. This is especially true for riding on rocky terrain. It’ll take a little more effort when you hit rocks to stay upright, but bend your knees more and square your hips off with the ground and you’ll be fine. If you know you’re going to be riding on wet trails, lowering your tire pressure just a little bit can do wonders. A softer tire will meld to the terrain better and keep you from slipping as much. Don’t entirely deflate them, obviously, but let just a little air out of each until the tire has a little give to it. Christopher is a poet, an avid camper, mountain biker, and craft-beer connoisseur. Outside of his freelance writing career he explores trails in the U.S., mostly in his home state of Maine, which offers many great trails and a whole lot of moose. He dreams of one day traveling across the country with nothing more than his bike, camper van, and beat up laptop so he can start writing the next Great American Novel.